Ninetology Black Pearl II ships with Android 4.0.4 Ice Cream Sandwich. This device is capable to upgrade to Android Jelly Bean. Android is an undoubted leader on mobile operating system mainly thanks to open source which allows any developer to freely modifies and distributes the software. Android and iOS, are predicted to continue dominate mobile platform market. Competitors like BlackBerry, Windows Phone, Ubuntu Phone, Firefox OS, Sailfish OS, and Tizen will not be real threats to the two juggernauts, Android and iOS in years to come. Malaysia company Ninetology launched Black Pearl II in November 2012. Black Pearl II is manufacture by Chinese mobile phone manufacturer, Shenzhen Tinno Mobile Technology Corp.. Tinno Mobile has already established some worldwide partnerships and sold their phones to all over the world. Ninetology rebrands Tinno Mobile s8073 model as Ninetology Black Pearl II and selling it in Malaysia. In other countries, Tinno s8073 also rebranded as Wiko Cink Slim in France, Fly IQ442 Miracle in Russia, i-mobile i-STYLE Q3 in Thailand, and MyPhone A848 Duo in Philippines. Black Pearl II is available in Black and White (back cover) colour variants. As expected, the built material feels cheap. The device has a chrome plastic frame surrounding the front panel. This type of frame should get tiny scratches easily and wears out. The back cover is made of glossy plastic. Altogether, the whole body of Black Pearl II is fingerprint magnet. You may consider getting a protective case for Black Pearl II as the camera lens position on the back could easily lead to scratches. 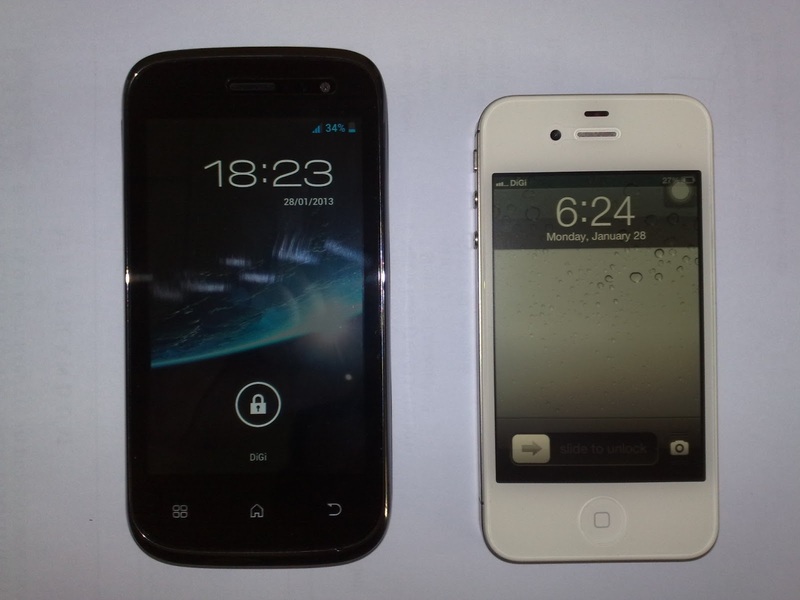 The dimensions of the phone are typical Android smartphones (129mm x 65.5mm x 10.3mm) and the weight 139g with battery. Due to its slimness, it is comfortable to hold in hand and carry in any pocket. Black Pearl II has an illuminated LED light indicator next to the front camera lens. Green light blinks when you have missed call or SMS. Red light blinks when the phone is under low battery level. Red light indicates the phone is charging. So, it is not necessary to turn on the screen to check missed call or SMS. 3.5mm audio jack and microUSB port for data transfer and charging is located on top of the phone. Black Pearl II comes with Dual-SIM connectivity. SIM card and memory card slots are under back cover. SIM cards and memory cards cannot be removed unless the battery remove first. Ninetology Black Pearl II has three capacitive buttons - Menu, Home, and Back. A volume rocker on the left side and power/sleep/wake button on the top. Low sensitivity of touchscreen makes swiping and tapping the screen quite challenging and unpleasant to use. The screen brightness has to manually adjust as there is no light sensor equipped. Black Pearl II sports a very decent 4-inch, 16 million colours, IPS capacitive screen. It has a resolution of 800 x 480 (WVGA) with ~244 ppi pixel density. This device's pixel density is slightly higher than the Samsung Galaxy S III mini's ~233 ppi pixel density, which is double the selling price of the Black Pearl II. With the IPS display technology, the screen remains accurate colours from all viewing angles. Only thing can complain is the screen is flickering noticeably in bright colour background. Any other than that, Ninetology Black Pearl II display is still one of the best screen among its rivals at this price range. However, slightly low sensitivity of Black Pearl II's capacitive touchscreen causing the device unpleasant to use. I always mistouch something while dragging the screen. For older batch of Black Pearl II, the multitouch screen supports 2 point touches only. New batch of Black Pearl II supports up to 5 point touches in the same time. To have more hardware tests of this device, dial *#*#3646633#*#*. Black Pearl II's rear camera is not 5-megapixel as it is advertised. It is actually a 8-megapixel camera with LED, face detection and auto focus. The front camera is 0.3 megapixel VGA. My subjective opinion on Black Pearl II's camera, it takes pretty decent quality photos and videos in good light conditions. In low light conditions, the camera takes a long time to adjust and focus the camera lens on a subject. The device is equipped with a Li-Ion 1600 mAh battery. My Black Pearl II is on V15 firmware version. The battery consumption is very terrible. Battery level percentage drops approximately 5% per hour in idle status. Therefore, the phone battery won't even last a day. Ninetology is aware of it and rolls out newer firmware to fix Black Pearl II battery issue. The battery life should last 2 to 3 days to recharge again on new firmware. Ninetology Black Pearl II's power charger (USB power adapter and cable) takes about 4 hours to fully charged from low battery level. There is room to improve as 4 hours to fully charged is a little too slow. The smartphone is built on MT6577 (Dual-Core ARMv7) with a 1 GHz processor and PowerVR SGX 531 graphic processor. It has 512 MB RAM and 1.5 GB internal memory for data storage. The overall performance is up to satisfaction considering performance/price ratio. Black Pearl II is capable running most high-end 3D Android games without lags. Ninetology Black Pearl II scores 6749 AnTuTu benchmark. Ninetology Black Pearl II features built-in GPS with A-GPS chip. The device fails to search for satellite signal under indoor conditions. Outdoor will be easier for it to pick up satellite signal comparing with indoor. I rate Black Pearl II's GPS below the standard of what it should able to perform. Black Pearl II speaker is loud and produce good sound quality. The signal reception is a little weak, especially in indoor. Vibration is average. Ninetology might be quite new in the mobile industry, the Black Pearl II runs Android 4.0.4 Ice Cream Sandwich, well-equipped with 4-inch IPS display and a Dual-Core 1 GHz processor for only RM499 (Manufacturer rebate RM100 included). In addition, if you are qualified for SKMM's Pakej Komunikasi Belia RM200 Smartphone rebate, this device is only RM299. Based on the ratio of performance to price, Keyables recommends Ninetology Black Pearl II i9400 as one of the best choice device for first-time smartphone or Android buyers on tight budget. I just bought this phone and the power is on during purchase. But due to low battery, I turned it off, but when i try to turn it back on, it just won't work. I charged it up to 9-10 hours after the purchase, but it still won't turn on. Have you encounter problems like this? No, I didn't. It isn't suppose to behave like this. Did you see a red light beside the front camera while charging? Try remove the battery and put it back again, power up the phone see if it works. Don't worry if the phone is defective. Ninetology's M-Warranty is a 1 to 1 exchange program for the first three months (90 days) from the date of purchase. some one know were i can get a hold on a black back cover to this phone? that delivers worldwide.